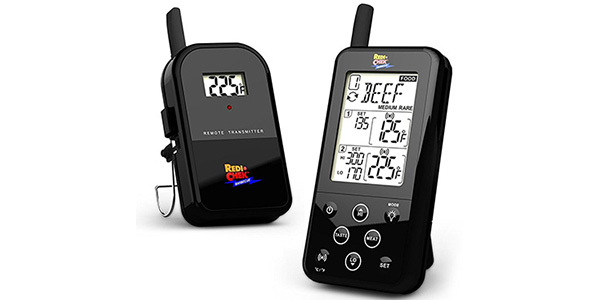 The Maverick brand has always been one of the go-to brands for digital meat thermometers for BBQ lovers. 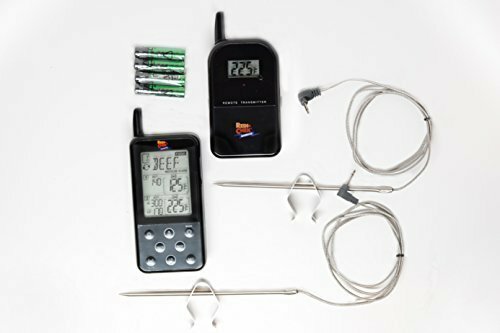 The ET-732 even made it onto our list of best smoker thermometers. But how does the latest addition to the Maverick family of thermometers hold up? In our Maverick ET-733 review we’ll take a look at all the new features, tell you the good and bad and give you some tips and tricks to help you make the most out of your new thermometer. Like most dual probe wireless digital thermometers, the Maverick ET-733 uses a transmitter that is attached to two probes to send the temperatures they pick up to a receiver that you can take with you. This is to allow you to do anything else whilst still giving you a live temperature reading of your food. There’s usually a bunch of other neat features that they include, which we’ll get around to, but the main one that the ET-733 has to offer is that the probes are hybrids. This means that both probes work as either meat probes or pit probes. This gives you a much more variety in how and what temperatures you can read. For example, you can read the standard meat and pit. Or you can have both reading two different meats, or both reading two different pits. The additional combinations might not be used every day but it’s nice to have them as an option. The Maverick ET 733 includes 15 meat pre-sets. These are the built in temperatures at which the system will alarm you when the internal temperature of the meat hits the pre-set temp. 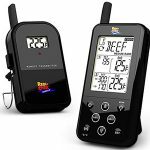 For example, the pre-set ‘beef’ temperature is 160°F, when the temperature reaches that number the system will notify you that your beef is ready. All of these pre-sets are easily customizable to whichever temperature you prefer. This is good because the term ‘beef’ is far too generalized and a single temperature is never going to over all the cuts of beef. Read our smoking times and temperatures charts for more information on the ideal ready temperatures of a wide range of food. There are also pit temperature alarms for if the pit temperature drops below or rises above the temperatures you choose. This very easy to set and can come in very handy if you have a charcoal smoker, for example. The high temperature alert has a range of 140°F to 572°F. The low temperature alert has a range of 32°F to 554°F. And the display will show 32°F to 572°F. This is a good range, and as it’s likely you’ll be mostly using this with a smoker, the temperatures easily cover the likely range you’ll be using. The display of the receiver has been updated from the ET-732. It’s now much larger and clearer. It looks a little cluttered on initial viewing, but after a while it becomes easy to read and understand. It even has a nice backlight for when it gets dark. The receiver has a 300 ft range that it can work in. There is an alarm if you go out of range for more than a minute. This is a fairly standard range but it’s got a good, strong signal that can penetrate several walls. You have the ability switch between Fahrenheit and Celsius. The Maverick ET-733 also comes in a range of colors including: black, white, green, gray, red and burgundy. 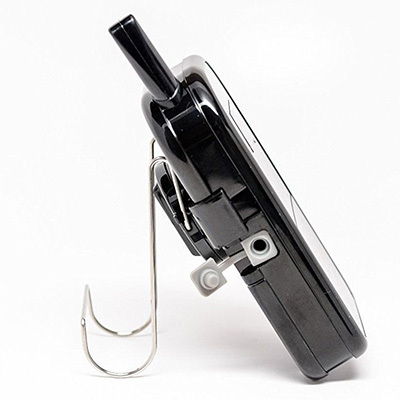 The clip in stand can also work as a hook so you can hang the transmitter on your smoker. The design of the Maverick ET-733 is very nice. It’s simple, fairly easy to understand and the receiver has a nice big screen that is perfect for anyone with sight problems. The buttons on the receiver are a little confusing at first but after one use they make sense. We’ve found the build quality to be generally quite good. Others have had their problems though. The construction and feel of both the transmitter and receiver are decent. They feel solid, despite being made from plastic. It definitely looks and feels of a consumer grade quality rather than a professional grade quality, such as the Thermoworks Smoke. It’s when we get to the probes that some problems start to arise. Our main problem is with the accuracy. We’ve found they tend to be around 5°F out. Whilst this isn’t a huge problem (and we might be being a bit harsh) it can make the difference between rare and medium rare. As the probes are hybrid probes, they aren’t as good as other brands that offer a probe solely for the meat. The main problem for us is that they are just too big! It takes effort to put them in the meat and they can leave a nice big hole that can affect the look of the meat and how it cooks. Other people have stated that their probes have lasted only a few cooks. The ones that we tested had been used several times before and worked fine, so we can’t comment on that. The speed at which the probes read the temperatures is respectable for the type of thermometer it is. With an instant read thermometer you’ll be looking at a few seconds, but this can take much longer. This is to be expected though, as it’s not made for quick temperature reads. These problems may be due to the error of the users rather than the probes themselves. There have been lots of reports of people washing their probes in water, completely submerging them, which is highly recommended against in the instructions. Going off of our experience, we used a set of probes that had been well looked after by someone that took their time and was very careful. And their probes worked fine. We’re not saying that it’s always the fault of the person, but there definitely are cases when it is. Check out our tips and tricks section later in the review to make sure you don’t make any silly mistakes when using thermometer probes. The problems with the probes definitely isn’t a deal breaker but is something to consider before you buy. It may be worth looking into buying some replacement probes straight away as a backup or as alternatives to the ones that are supplied with the ET-733. We recommend picking up these. They are waterproof, built well, are very accurate and tend to last for a long time. We found the ease of use of the Maverick Et-733 to be fairly good. It was easy to set up out of the box, requiring a screwdriver to insert the batteries. This wasn’t a problem but we can imagine it being a nightmare if the batteries run out half way through a cook and you can’t find a screwdriver. The probes inserted into the transmitter easily. They might require a bit of a push to get them in properly. When it comes to programming the temperatures and alarms into the system it might get a bit more confusing. We’re fairly tech savvy but the buttons got us confused at first. After we got to terms with the buttons the set up was fairly simple. It’s nice to have an up and a down button, unlike the old ET-732. We’d recommend reading the instructions or watching this video to make it as easy as possible. Are the new features of the ET-733 worth the price increase over the ET-732? With a general increase in price of around $20 the ET-733s new features must be quite good for you to consider it over the ET-732, seeing as Maverick are still selling it. The ET-733 has the new hybrid probes. This is a pretty big deal, and despite the potential problems with the probes we think this is a great new feature that makes the ET-733 almost worth it by itself. The new receiver has a much better screen. This makes it much more user friendly and is generally easier to use. The added backlight is nice as well. The user interface is different. There are a few things that are better with the ET-733, such as the pre-sets and the ability to go up and down in temperature, rather than having to go back all the way around if you overstep your temperature. But it’s easy to get confused with the new layout. We really like the new screen and the hybrid probes. This might be perfect for you. But if you’re looking for something simpler and a little more traditional, then the cheaper ET-732 is the one to go for. The Maverick ET-733 is a great smoker thermometer. It has all the features you could ever need. Despite a few problems here and there we’d recommend this to anyone. If you’re looking for a first time dual probe thermometer then this is a smart choice. It will make a huge difference to how you smoke and will save you loads of time whilst helping you perfect your results. 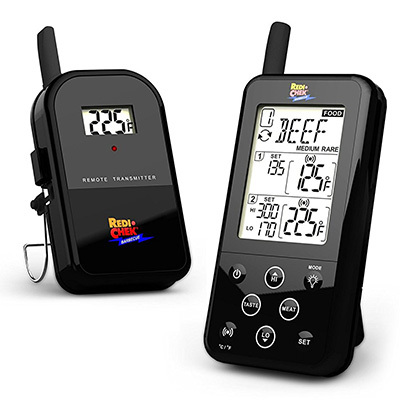 It has a good range and a strong signal, so you’ll be able to go anywhere in the house and do whatever you want, whilst still being able to keep a close look at how the meat is getting on in your smoker. Check the latest price of the Maverick ET-733 thermometer on Amazon. Always keep the temperatures under the temperature rating. This is one of the biggest killers of digital thermometers. It’s easy to accidentally touch the grill grate which could be hundreds of degrees above the recommended max temperature. Going above the maximum is likely to damage the cable that the probe is attached to which can instantly kill the probe. Make sure all your connections are pushed in hard. There have been several reports of disgruntled customers thinking their thermometers are not working when in actuality they just haven’t read the instructions properly. A lot of people simply needed to push the probes into the monitors further. One of the most important parts of using a digital smoker thermometer correctly is the placement of the probe. If you’re looking to place the probe on the outside of the meat then we recommend keeping it around 2 inches away from the surface of the meat and about 1 inch above the grate. Feel free to play around, but you’ll see some surprisingly drastic changes in temperatures with very little movement of the probe. When placing a probe inside the meat, try and aim for the very center. You can find the Maverick ET-733 manual here. We hope this has helped you decide if the Maverick ET-733 is for you. Let us know in the comments if you have any questions and we’ll gladly get back to you.